Bee identification is not always simple, and it does take practice. For one thing, not only do some of the different bee species look very similar to each other, but they may also be confused with other insects which, for a variety of reasons, mimic particular bees. So here are a few quick tips and features to look for (please note, a link to free ID charts can be found at the bottom of the page) . In other words, bees have four single wings - two on each side of the body. Some of the flies commonly mistaken for bees only have one set of wings. However, please note that wasps also have two sets of wings. The way an insect moves can help you identify a species. One example, is in the way an insect grooms itself. 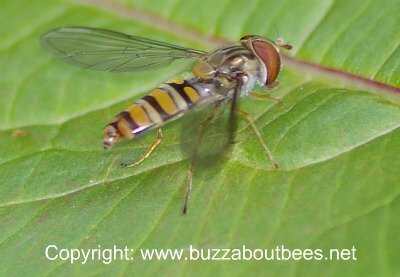 Many flies – including the hover fly Volucella Bombylans, (which can be mistaken for a bumblebee, along with some other hover fly species), extend their fore legs out in front and appear to be briskly rubbing their feet together, perhaps even for a few seconds at a time. This behaviour is also commonly seen in houseflies, as a further example. Bees do groom, but they are more likely to be seen cleaning their backs, limbs and antennae in a kind of 'wiping' fashion. 3. Check The Eyes and Antennae! The eyes of hover flies are comparatively large and often seemingly comprise the whole head, and any antennae (if present) are short. Bees have large eyes, but often resembling a kind of 'eclipse shape' when viewed from the side, and bees have long antennae. Below is a honey bee, Apis melifera - note the eye shape. Bees carry pollen in different ways – some solitary bees carry it on the underside of the abdomen, bumblebees and honey bees carry pollen in pollen baskets (corbicula) on the hind legs. However, male bees and cuckoo bee species (including female cuckoo bumblebees) won't be carrying pollen on their hind legs. This means that if you don't see pollen baskets, it nevertheless could still be a bee that you are looking at! 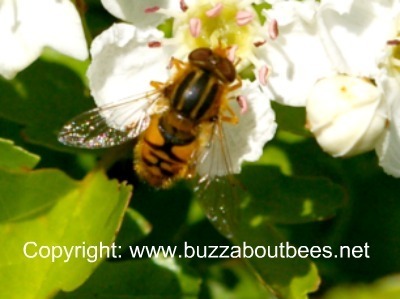 A number of insects may be seen gathering nectar, including the bee fly, which is a fly, not a bee! Below is a video of a bee fly - often mistaken for a common carder bumblebee. As stated previously, sometimes the differences between the bee species and bee families are quite subtle. Some solitary bees could easily (at first glance) be mistaken for bumble bees or honey bees. 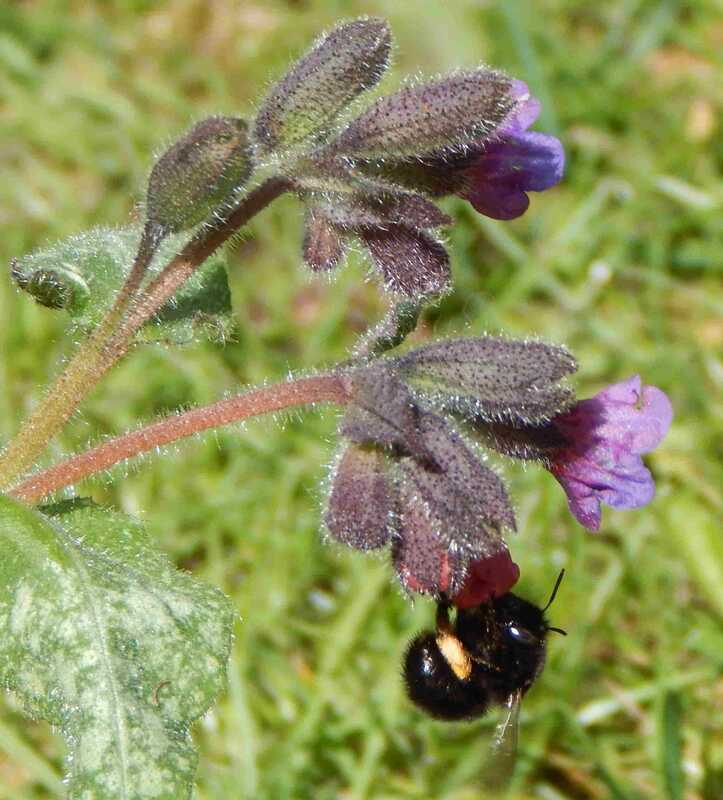 For example, below is a photograph of a solitary bee species, the hairy footed flower bee. At first glance, it could easily be mistaken for a small worker bumble bee. 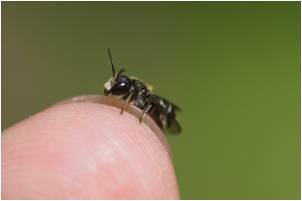 Some solitary bees are very tiny, and mostly go about their business unnoticed by humans. Many look like small flies. such as heriades truncorum - the large headed resin bee pictured below. 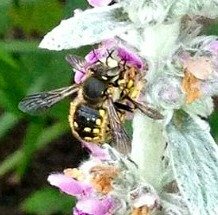 Then there are a number of carder bees and solitary bees which also look very similar to wasps, such as the nomad bee, or even the wool carder. Cuckoo bumblebees are parasitic, and easily mistaken for social species - or 'true bumblebees'. Yet the behaviours of cuckoo bumblebees is obviously quite different from their target host - read more about cuckoo bumblebees. 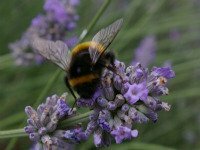 There are of course a range of characteristics that can help in the process of bee identification, but these need careful observation (such as the colour of hairs on hind legs and face). One of the best things you can do if you are really interested in bee identification, is to get a book. Charts are handy as a back up and to take with you out in the field, but a decent book will provide you with additional tips and hints – and there is too much information to convey here! Charts are okay for a bit of fun, but to be able ot correctly identify bees, pass on the information to others, a book will provide you with helpful background, and can be referred to time and time again. For a highly readable but very comprehensive guide, with excellent photographs, interesting snippets and wonderful bee identification advice, you cannot beat The Bees in Your Backyard: A Guide to North America's Bees, and I have written a comprehensive review of the book here. 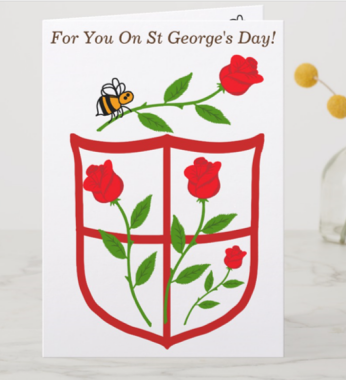 For a guide to bees of Britain and Ireland, Stephen Falk's book is detailed and beautifully illustrated by Richard Lewington - illustrator and artist - he was also created the beautiful postage stamps for Royal Mail. 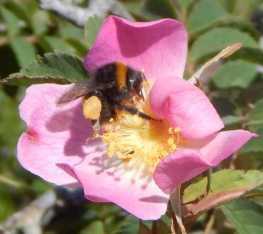 .....often based on the striped and somewhat cuddly looking bumblebee. 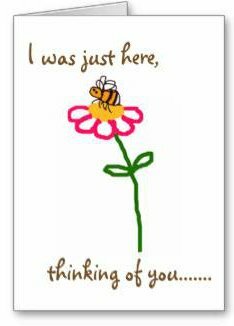 But remember that worldwide there are about 25,000 known species of bee – and probably there are more to be discovered. Bees are diverse in appearance. How about this species below for an alternative image of a bee? Quite different from the fluffy little creature pictured above. 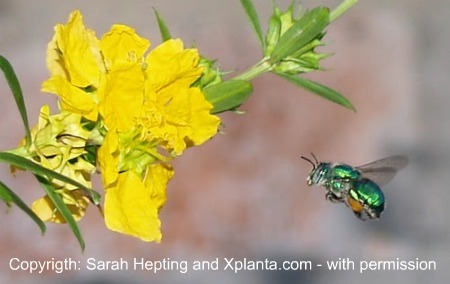 This is an Orchid Bee – found in Mexico. I’m indebted to Sarah Hepting and Xplanta.com for permission to use the image. Bees belong to the same insect order as wasps, ants and sawflies: hymenoptera. Read more here. Bees are very important pollinators. 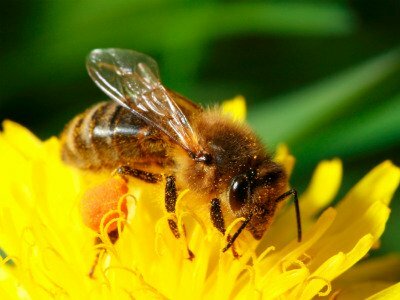 Discover more about the different roles of our bee species, in pollination.